In the Democratic Republic of Congo, indigenous peoples have a special relationship with the forest, which is one of the foundations of their way of life and culture. Unfortunately, they have had to suffer, to varying degrees, marginalization from other local populations. WWF naturally became interested in the fate of these populations while implementing forest management projects. In 2010, WWF started working on structuring the largest platform of indigenous associations: the Network of Indigenous and Local Populations for the Sustainable Management of Forest Ecosystems (REPALEF). This network presently includes 180 member associations reaching 30,000 to 50,000 people in all the DRC provinces. This platform aims to increase the participation of indigenous peoples in the sustainable management of natural resources in the country. WWF has been working to strengthen the capacities of REPALEF leaders through training on forest legislation and negotiations with forestry operators as well as experience-sharing trips. Through participatory mapping supported by the WWF, the indigenous peoples’ living space has been made more secure. 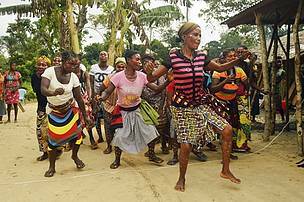 Additionally, WWF has also sensitized other communities to recognize the dignity of indigenous peoples. In Mai-Ndombe, for example, where it was virtually quite impossible to bring local communities and indigenous peoples together to discuss natural resource management issues, the views of indigenous peoples are now taken into account. One initiative worth mentioning is the PFCN (Forestry and Nature Conservation Project) program, which was implemented by WWF between 2010 and 2015, financed by the World Bank. This program included actions specifically targeting indigenous peoples, which have benefited from several rural development projects in the areas of livestock, reforestation, fish farming, soap making and others that effectively contributed in improving the daily living of many families. Local communities and indigenous peoples are demonstrating a great interest in social infrastructures realization by logging companies: schools, health centers, administrative premises as provided for in their forest management plans. Indeed, the new 2002 Forest Code includes in its provisions the introduction of social clauses which are a negotiated agreement between local communities and forest holders for the construction of socio-economic infrastructures such as schools, hospitals and transport facilities. WWF conducts an independent monitoring of these social clauses compliance by local NGOs, some of which are members of REPALEF. Things are still on their early stages and the reform of the DRC forestry sector is a process that still has a long way to go. In Mai-Ndombe more precisely in Loile, a region where strong discrimination against indigenous peoples was noticed, the logging company SODEFOR built a brand new school in a village of indigenous peoples which is now the pride of the inhabitants. REPALEF remains a credible structure capable of sustaining the positive outcomes from the of natural resources management, he added.